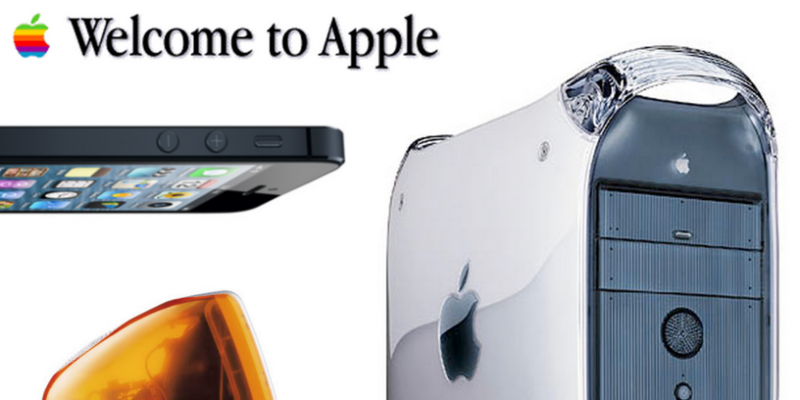 Having grown up watching Apple grow up, I got a little nostalgic and decided to put together a slideshow of the Apple website from 1997 through 2014. Sit back, relax, and reminisce… I will provide some useless remarks along the way as it’s Friday and a good day to have some fun. I also put this together as a kind of a visual study in how website design has changed over almost two decades. Navigation links are at the bottom of each page. There are 42 screen captures in all, spanning up through the end of 2014 with a particularly long stretch through 2001 as that was an interesting year. 01. 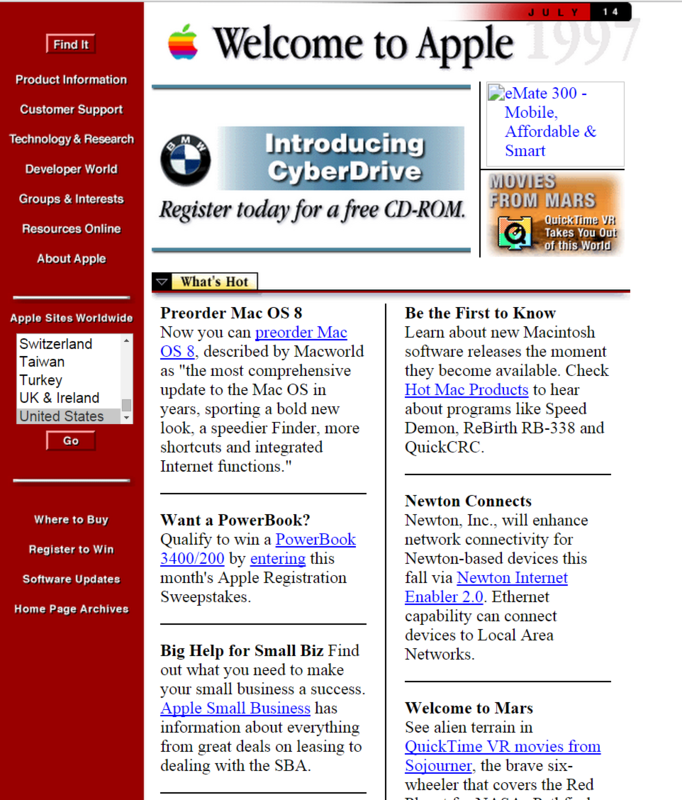 Kicking things off, this is the earliest apple.com website image I could find and it dates back to the glorious year of 1997! Anyone have any clue as to what BMW, Apple, and Cyberdrive all were? August of 1997 was also the infamous month during which Microsoft invested around $150 million into the then floundering Apple and kept it afloat and Microsoft deftly avoided an anti-trust lawsuit in the process. 02. I actually remember encountering an iMac for the first time in the Jr. High. It was and odd piece of plastic all around that worked all-right but what was up with the puck mouse? 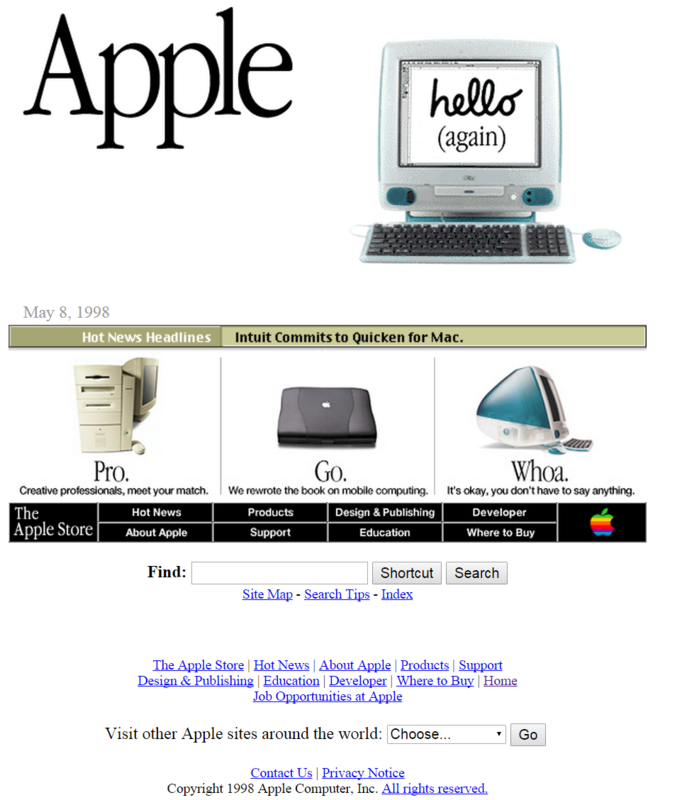 Looking at the site design… Apple used to stick the date on its webpage, I guess in a magazine style format? This screen cap is from their site as it was in 1998. They didn’t keep their original website design for long as you can see a big change in look and feel from 1997 to 1998. 03. 1999… one of the things I remember from this year (like any good nerd…) was that this was the year the Matrix was released. For all of us living at the time, it was also a cherished year as it was going to be our last on earth. That’s right, the Y2K bug was going to hit hard that coming new year’s eve. 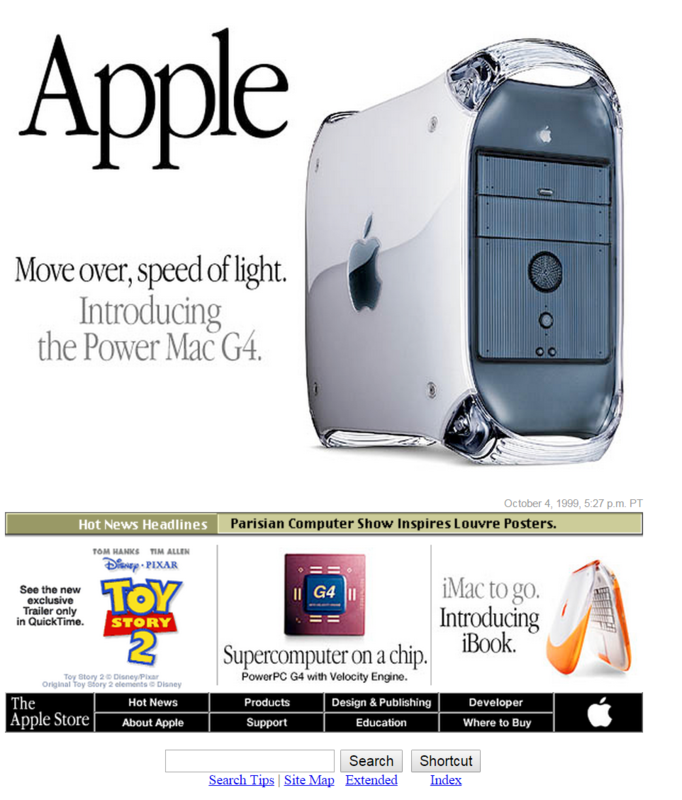 We were going to be thrown into a post-apocalyptic world where we wished we had stocked up on food, water, and toilet paper, instead of spending our cash on that beautiful Power Mac G4, which would be no more than a nice paperweight after the electrical grid collapsed.